In a wide range of industrial and defense applications, materials are required to perform at extreme operating conditions involving large plastic deformation, high strain rates, elevated temperatures and severe dynamic pressure. For example, materials used in armor and antiarmor technology experience deformations of 500% and higher, strain rates up to 106 per second, temperatures above the material’s melting point and pressure of several gigapascals (GPa). 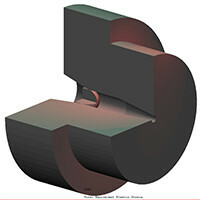 Likewise, in industrial applications such as forging, hot rolling, extrusion, wire drawing and sheet metal forming, workpieces undergo plastic deformations ranging up to 100%, temperatures from 500oC to 800oC, strain rates up to 100 per second and pressures up to several hundred Megapascals (MPa). Other examples of applications where high deformations, temperatures, strain rates and pressures are experienced include perforating guns in the oil and gas industry, debris impact in aerospace engineering and ship collisions in naval engineering. Now that TECHDYN has validated their material model and ability to simulate extreme conditions, the company is preparing to offer engineering consulting services using Marc with the new material model to provide accurate simulations of extreme conditions. “The ability to accurately simulate extreme conditions will help improve product performance by making it practical to evaluate many more design alternatives than would be practical using the build and test method while at the same time reducing product development cost and leadtime,” Bonora said.